It's snowing like crazy here today! We are supposed to get 6-10 inches! YUCK! Any of you warm weather ladies want to change places with me for the winter? I think it's going to be a LONG and snowy one! The boys got dismissed early from school, the roads are already a mess and it's going to be a long night for Michael who will end up plowing anytime now! He said he is moving at 8mph on the highway right now! At least it's going slow and maybe there will be less accidents! So that's my post for today! Hope you all have a great one! what a gorgeous ornament...that Chris is a talented girl! I wouldn't trade places with you but you are more than welcome to come visit here in CA...I promise no snow! Safe plowing Michael, let's hope the drivers there don't drive like they do here in bad weather. It just started lightly snowing in Maine. Don't think we are supposed to get more than 3-4" but we know they've been wrong before! I'm just sayin' that I love that you are using I'm just sayin'! I think we should make tshirts and sell them... maybe we could make millions!! Oh Pam! What a GORGEOUS photo!!!!!!! 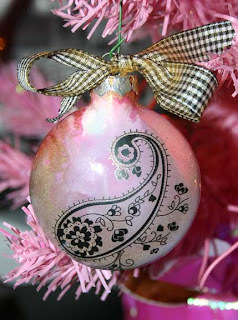 Beautiful ornament & such a simple idea....love it!! Sending warm, 70ish weather vibes your way:) It's gorgeous down here rightn ow!! Love the ornament. I HEART pink too!